Sometimes it isn’t so easy to choose a right jacket or blazer, so we’re ready to help you. 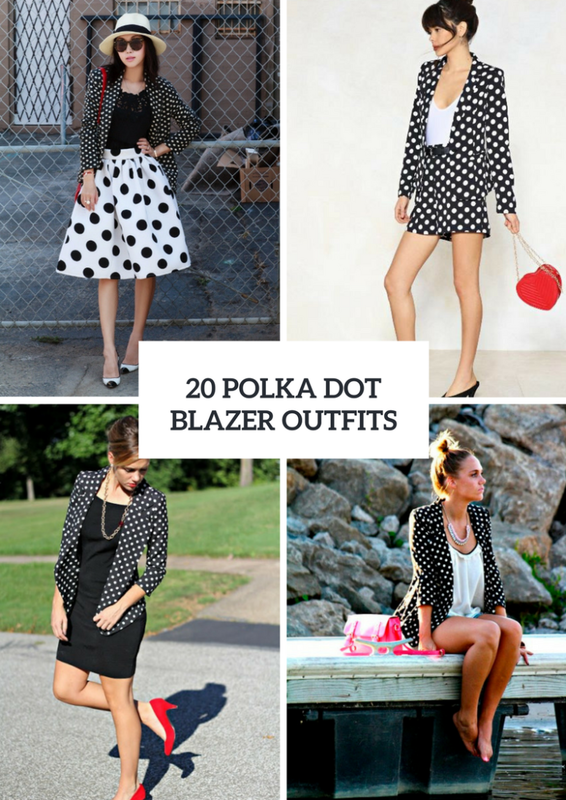 Today I want to share with you outfit ideas with polka dot blazers, and, I’m sure, you’ll like them. 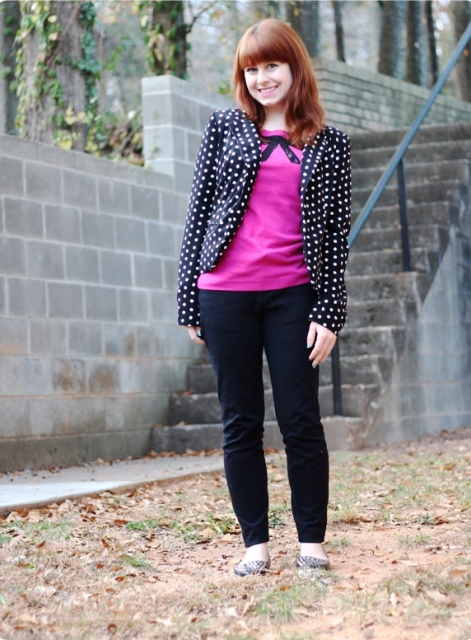 As usual, you can choose any type of blazers with this print from a straight to peplum one. 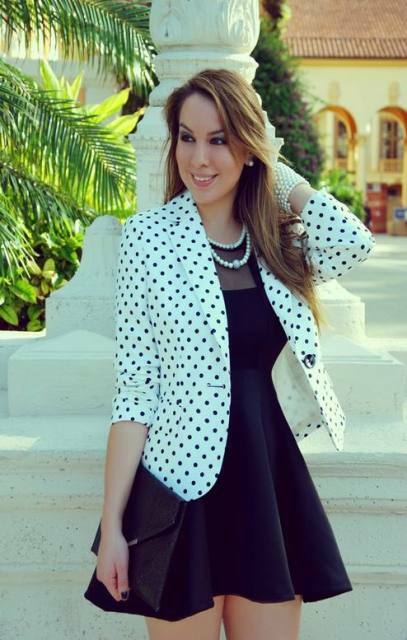 Of course, don’t forget that you have a really big choice of various colored blazers, for example, for casual or more official looks you can choose a white and black blazer, and for party or event outfits pay your attention to a navy blue blazer with white dots or a white jacket with red dots. Scroll down to get inspired! If you want to create a casual outfit, then take white cuffed skinny pants and combine them with a yellow shirt, a polka dot blazer, striped pumps and a black clutch. Or you can choose a beige shirt and mix it with navy blue skinny pants with black dots, white shoes, a blazer and a black backpack. Love to wear jumpsuits? 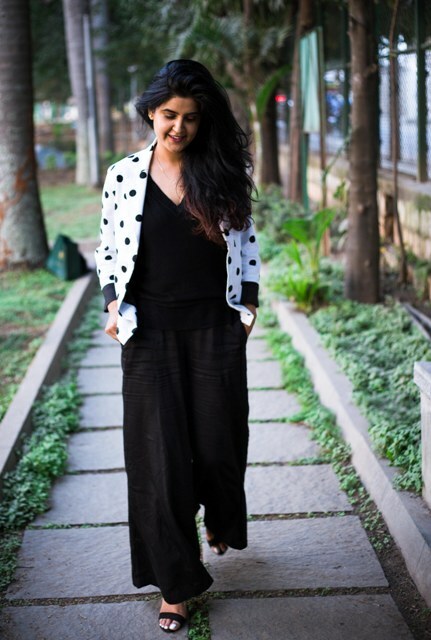 Then take a look at wonderful idea — you can pair a black wide leg jumpsuit with a white blazer with black dots and black sandals. 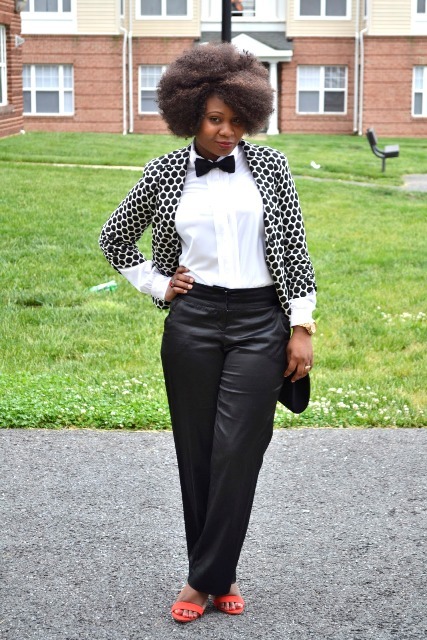 For warmer days you can combine a polka dot blazer with polka dot high-waisted shorts, a black belt, a white top, black kitten heels and a red heart shaped bag. Do you like bright colored clothes combinations? Then repeat an outfit with a white blouse, a red skater skirt, a crop polka dot blazer and a red leather bag. Wanna create something elegant and chic? Then take a classic black dress and pair it with a blazer, a chain necklace and red suede kitten heels. For more ideas look below.